As a FocalPoint Business Coach, I often am working with my clients to help them build strategic plans and establish goals for their business or organization. We use a set of eight foundational questions as part of our strategic planning process. Question #8 is to identify specific habits that are necessary so it will become second nature in their business to achieve the goals they have set. I find this to be a very interesting concept. How does a business create new habits to achieve goals? How does a business create new habits to achieve goals? Evidence now suggests that it takes an average of 66 days for a person to create a habit. (Source, University College London) This is much longer than the 20-30 day number that we have heard for decades from experts like Carnegie and Hill. But I believe there is much validity in this new research. I know that I have personally had to work hard to develop habits of taking better care of myself and managing my time better. And, I know, that these habits don’t change after a period of weeks. It takes months to develop a habit that is unshakeable. 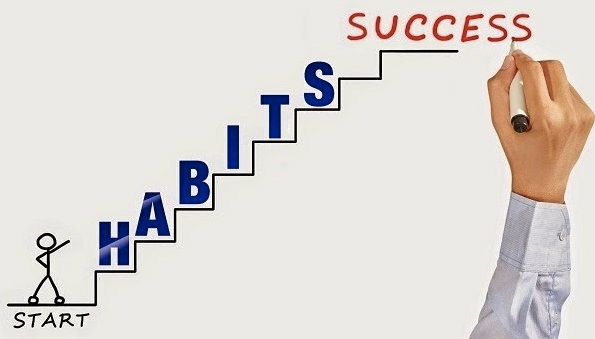 How much harder, then, is it for a business to develop habits? I believe that it takes at least three if not six times longer for a business to develop a habit. That means it takes six to twelve months for a business to truly incorporate a behavior into its processes and personality so that it becomes habitual for employees to behave in the prescribed manner. First, we have to remember that we are dealing with a plurality of people, not just a single person. Let’s say we want to develop a habit of always being on time for our customer appointments. (Good idea, but not all businesses are good at it). Personally, I can make that a habit for myself fairly easily, because I hate being late and always try to be early to appointments. But let’s say we have Tardy Ted, the engineer that is always behind schedule. No matter how hard I work to be on time for my appointments if Ted is always tardy, we haven’t developed it as a cultural habit in our company. Second, the leadership can derail months of progress in a single statement. I once worked with a company where we developed a “customer experience” mindset. The idea was to make every customer experience seem like they were having a gourmet meal at a fine dining restaurant, even though they were in the construction business. The team had made great progress, and you could see the improvements happening in customer relationships and in the feedback we were receiving. And customers didn’t seem to mind paying extra for the “experience”. But then, one day, the CEO went on a tirade with some of his team, explaining how they needed to just get the work done and move on to the next job. It seems he had forgotten everything about our strategy related to the customer experience. And that one meeting set the team back months in building this habit. Third, and this is related to the previous point, companies while made up of people, are not people. They are businesses. Organizations put together for a purpose. Ultimately, that purpose is to make a profit. Or, as has often been stated, to gain and retain customers. And sometimes those purposes get in the way of developing habits. For good or for bad, the consequences of short-term measures sometimes overcomes the most positive of intentions. In his book “H3 Leadership: Be Humble, Stay Hungry, Always Hustle” author Brad Lomenick shares a Duke University study that showed that more than 40% of actions people performed each day weren’t decisions, but habits. Think about that for a moment. That means that nearly one-half of the things you do are done out of habit, not out of conscious decision-making. Now, if this is talking about things like making a cup of coffee and turning on your computer, then fine. But more than likely there are many other more important items that fall into this. The response you sent to your customer. The email you sent to your team. The way you prepared your store for opening this morning. The greeting you gave that first-time guest. What did you do today out of habit that should have been better thought out? I am sure you can think of something. 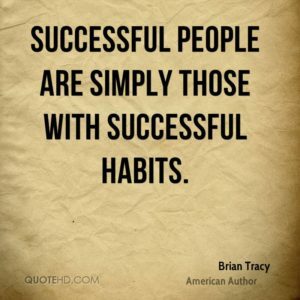 But that is why habits are so important. If you develop a habit of always greeting new guests with sincerity and optimism, then it’s okay to do it “by habit”. If you always address emails to your team in a positive manner that encourages them and drives to better outcomes, then okay, go with your habit. But sadly, most of our habits are lazy and not so productive. That is why it is so important to cultivate good, positive habits. Back to that foundational question we ask. Can you identify specific habits that are necessary so it will become second nature in your business to achieve the goals you have set? How do you, as a business, create new habits to achieve goals? This is part of what I do as a business coach. My goal is to help you achieve your goals. And one way of doing it is to identify those habits that you need to make second nature among your team. If you haven’t thought about this, I encourage you to do so. And if you would like some help, contact me today. I would love to help you create new habits to achieve goals!